This article was originally published in the Magazines at Retail conference magazine, produced by PBAA. As many in the industry are aware, IPDA has hosted a series of seminars by RetailNet Group (RNG), detailing the transformation underway within the retail industry. At this year's Magazines at Retail Conference, RNG VP Tim O'Connor will build on those events by reviewing the core dynamics behind the retail transformation, and offering insights as to how the magazine category can turn challenges into opportunities. 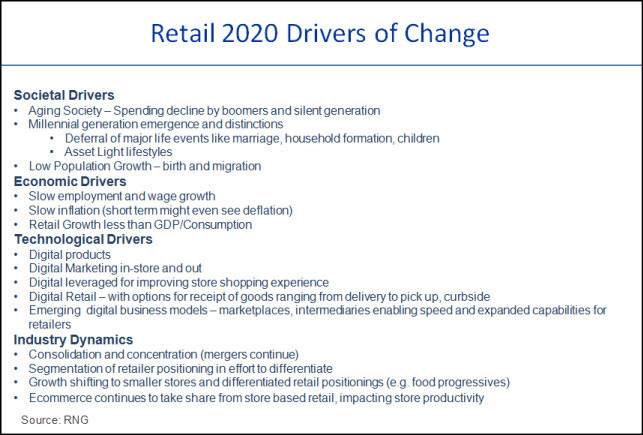 Based on an interview, here's a preview of a few of the points that O'Connor will be covering in greater detail during "Retail 2020: Finding Opportunities," a session that also features independent retail insights consultant Todd Hale. * Major shifts in macroeconomics, societal trends, technology and other factors (summarized below) are changing traditional, store-based retailers' core assumptions about how they can gain competitive advantage to grow in the years ahead. This, in turn, is driving a transformation of retail economics and business models, characterized by disaggregation of channels and logistics networks, integration of digital and physical retailing, and restructured store formats and strategies. * Certain shifts are of particular concern to magazines, books and other impulse-driven categories, because they reduce or eliminate time in stores, and trips down the center aisles and through checkouts. This is certainly true of emerging e-commerce and hybrid models, including home delivery of online-ordered food and goods (where expansion is being driven by partnerships with new, independent third-party delivery networks); and click-and-collect (goods picked up at a designated area in store, curbside or at a depot dedicated to that purpose). Another challenge to impulse sales: Apps and new in-store digital capabilities enable one-to-one, transaction-based promotion offers, but they'll also increasingly give shoppers the ability to tally purchases as they shop and pay for their transactions digitally—bypassing the traditional checkout process. In addition, mainline magazine displays face challenges resulting from food retailers' ongoing shift to emphasizing store perimeters and deemphasizing traditional center-store products and categories, in response to growing consumer demand for fresh, unprocessed foods. 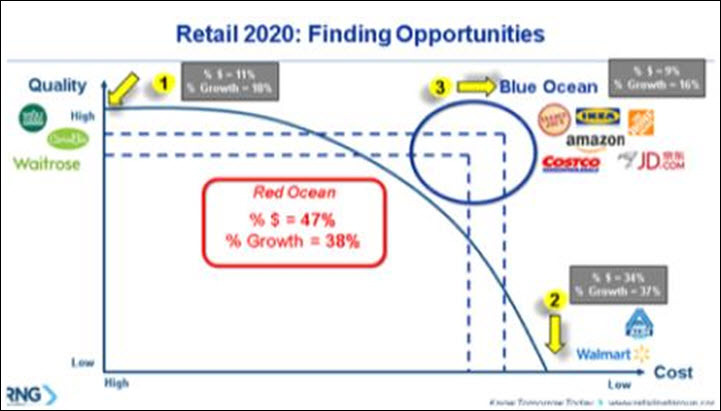 * There will be two primary retail growth strategies in the years ahead: A low-cost position based on operational and merchandising simplicity, scale-leveraging and little human interaction; and a differentiated, premium/high-cost positioning characterized by intentional complexity (trend-forward merchandise and a focus on the total customer experience. There is also a third growth strategy that's particularly powerful, but difficult to achieve and therefore relatively rare: high quality combined with low cost, sometimes referred to as a "Blue Ocean" strategy. Current examples of retailers with a high quality/low cost model include Trader Joe's, Costco, IKEA and The Home Depot. * Retailers that employ one of these three strategies—particularly a Blue Ocean strategy—are projected to realize high return on invested capital (ROIC) and gain share between now and 2020. Those that fail to adopt one of these, and adhere to traditional, "Red Ocean" strategies, are expected to experience low ROIC and lose share. The long-term prospects of Red Ocean retailers—which currently comprise 47% of all retailers, according to RNG—are questionable unless they change course quickly, stresses O'Connor. 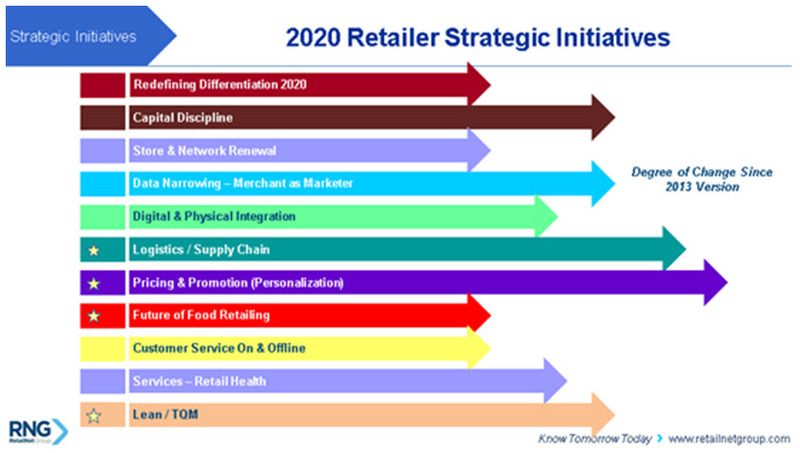 * The major initiatives underway among retailers positioning for success in 2020 are summarized in the list below. Which ones are the focus within a given retailer depends on their current status within these key areas and on which ones they assess to be most crucial for their future growth and profitability. How Can Magazines and Books Respond? *The drivers of change impacting retail are inevitable and unavoidable. *Suppliers' own health and growth will depend increasingly on adapting to digital retail realities and aligning themselves to the greatest extent possible with retailers that are adopting one of the three growth strategies described above, and the formats associated with those. The retail channels that will win in compound annual growth rate terms are discount, premium, digital/direct, click-and-collect (order online; pick up at a store or depot), and express (new "fresh-forward" C-store formats and quick-serve restaurants). *Suppliers are well-advised to do their own "Red Ocean versus Blue Ocean" analyses. "Ask yourselves: Are we as publishers, national distributors and wholesalers, and the category and channel as a whole, adapting and positioning ourselves to align with progressive retailers?," suggests O'Connor. "Are we prepared to be true partners with these retailers as they transform? Or are we stuck in Red Ocean mode, adhering to traditional thinking and operating methods that will soon be obsolete?" Alignment and effective partnering require that category leaders start with the research and face-to-face meetings required to develop an understanding of the specific strategic focuses of the individual retailers that can drive the category in the coming years, he points out. While retailer initiatives pose challenges, quite a few also present potential opportunities for the magazine category—particularly given its solid profitability, and the regular frequency of new content that can trigger a trip or help create customer loyalty, O'Connor stresses. * Store renewal: In an ever more competitive environment, retailers are being compelled to improve the experience and ease of shopping in existing stores. That requires rethinking all aspects of the business, including the entire layout and product assortments. In large stores, this will free up space, which retailers will want to use to create destination areas featuring high-margin products and services that drive up basket size. Print media, which can attract shoppers with their content and presentation, are in many respects uniquely positioned to contribute to that objective. Working with retailers to establish adjacencies to the growing number of in-store restaurants and cafés—or even "bookstore" areas for sitting and browsing—is one important opportunity to explore. Using magazine brands' and books' status to create engaging, traffic-driving in-store events, including activities around special magazine editions, book signings or celebrity appearances, can also be a major differentiating point for the categories. * Moving from a focus on pricing to personalization and value-added relevance to the shopper: More targeted, personalized value-added offerings enable retailers to achieve differentiation outside of price competition (increasingly critical, now that consumers can price-compare across retailers at any time, including while in store). Publishers can offer value-added content in many forms (see below). And given changing retail dynamics, the category can benefit from offering more tailored and segmented magazine assortments and content offerings to fit specific store positionings and shopper segments. If approached with exclusive programs or offers that support their specific initiatives, retailers may be open to pushing these out to targeted customers through email or other database-driven CRM channels. * Integration of digital into the in-store experience: Investments in sophisticated digital network and display capabilities that interact with smartphones, including GPS-driven beacons and sensors, are an integral part of store renewal. Harking back to the drive to hone targeting and personalize offers, the ability to make one-to-one, transaction-based promotion offers to shoppers in store is expected to be a crucial marketing advantage. For publications, these capabilities present numerous opportunities for communicating with and influencing shoppers in store, to benefit retailers, as well as their own sales (and perhaps their advertisers'). Offering coupons or special offers on single-copy magazine purchases is one obvious possibility. For the right offer or partnership initiative, a retailer may even be open to putting the magazine on its "push to list" function (about 40% of retailer apps let users respond to an offer by simply pushing a button to add the product to their digital shopping lists). But coupons and offers are only part of the picture. What about using beacons' location-based capabilities (or phones' sensor and code-scanning capabilities) to offer shoppers the ability to click to view magazine-branded videos and other digital content through their smartphones, when they're near a synergistic display or area of the store? The content could serve as a teaser to prompt a purchase of the print magazine issue while in store, in order to get the full story or a themed special interest publication. Or, shoppers might be offered later access to additional, exclusive digital content with a purchase of the print magazine in store. Publishers might also develop magazine-branded, exclusive digital content for key retailers. Such content could offer shoppers additional usage information or ideas or recipes for the food items, products or services that they're near in a store, for example. Helping retailers engage shoppers and drive additional sales through professionally produced value-added content from trusted magazine brands should be an important differentiator and advantage for magazines in building relationships with retailers—which can in turn lead to expanded display and initiative opportunities. In some cases, the availability of special digital content might be promoted on in-store signage or special displays, as well as on individual shoppers' smartphones. And seeing any form of branded content or messaging, whether on a screen or physical displays, is bound to motivate or remind some shoppers to seek out a copy of the print magazine at the mainline or checkout.